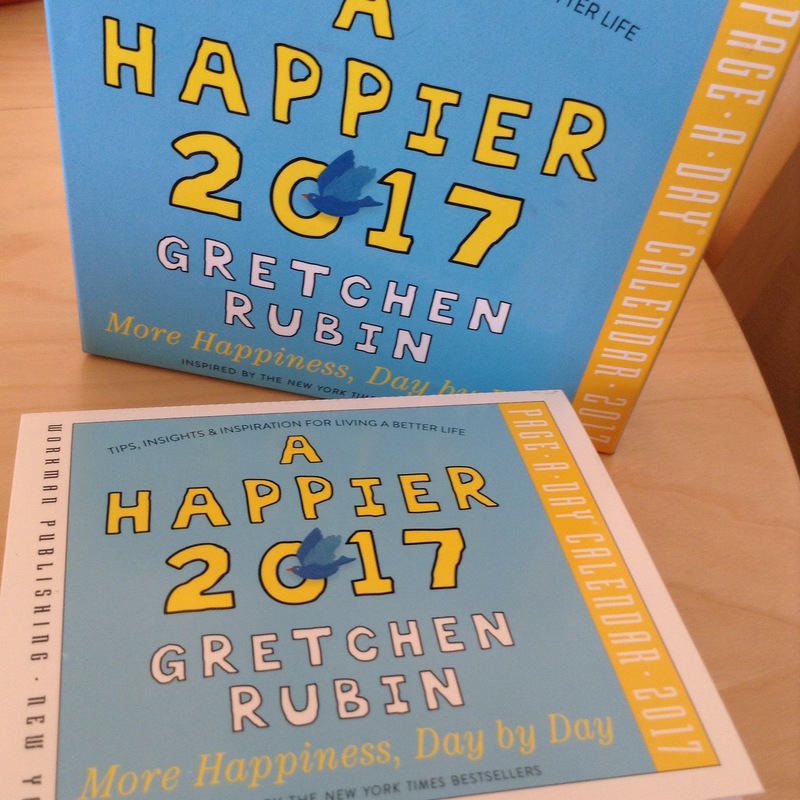 One of my birthday gifts was a page-a-day calendar by Gretchen Rubin, author of The Happiness Project. The gift intrigued me as her writing is on my list of books to read. I have placed the calendar on my bedside table and read the extract every morning as I am getting ready for the day. The first entry in the calendar asked me to choose a word that would be my theme for year of 2017; a word that would guide my thoughts and actions over the coming months. The word that came immediately to my mind was ‘discipline’. This word will be linked to my goals for the year, my tentative New Year’s resolutions. In my context, the word discipline means more than punishment for wrong-doing; it means more than following a set of rules. Instead the word ‘discipline’ refers to using self-control to attain my goals. This self-control would need to show itself in all aspects of my life. In the Workplace: I enjoy my work and put my all into it. I enjoy spending time with the children, planning the lessons, and working on the assessments and documentation of their learning. I am, however, a person who wants everything to be done properly and completely. Many times I find myself staying longer at work than I should just so that I can complete things to my satisfaction. This year I need to focus on putting aside the work, locking my classroom door, and leaving the school building. I know that I cannot achieve many of my goals if I do not have the self-control to put my work aside. On Eating: This year I wish to work on my self-control when it comes to eating sugar. From past experience, I know that the best way to achieve this is to avoid bringing products into the home that contain the refined sweetener. I have already begun this process and my family are complaining when they have a desire to eat something sweet. 🙂 We will all need to get into the habit of reaching for a piece of fruit instead! On Fitness: During the Summer of 2016, I began my fitness journey. This year, I wish to continue with it. I wish, however, for the journey to be more disciplined. I will continue to fight the inner battle between staying at home (warm and relaxed) as opposed to walking out into the cold to go to a group fitness class. I have set out a schedule in my journal that I wish to follow. The first week of 2017 was a success exercise-wise. The test comes when I begin working and am tired at the end of the day. On Blogging: Blogging brings me pleasure and is one activity that I wish to continue during 2017. It does, however, require a certain amount of self-discipline to blog every day. There were times during 2016 when blogging was not a priority because of my responsibilities at the work. I am hoping that with improved self-control, I will be able to balance my work responsibilities and my pleasure in blogging. On Writing: I enjoy writing and blending words together to create an image in the reader’s mind. During the past year, however, I noticed that the number of times I wrote creatively had dwindled. Will my focus on discipline enable me to write once again? Time will tell. If I look even more into my life, I am sure I will find other areas in which my word for 2017 will create an impact. As the year progresses, I will write on how the word ‘discipline’ is (or is not) an integral part of my life. What is your word for 2017? If you have written a post, I invite you to share it with us in the comments. The very first word that entered my mind when I read it was “onward!” with the punctuation included. I hope “discipline” (in a good way) works for you this year. Sounds like a cool calendar. I like it. I am thinking of blogging about some of my thoughts in response to the quotes and challenges given in the calendar. Making a home for our family definitely benefits all of us. It is a place where we can be ourselves within a pleasant environment. I like this idea! My word for 2017 is “holistic.” I think this will help me keep in mind the big picture. Yes, instead of focusing on the small details. Enjoy your year focusing on this type of experience. very good word, C. and I like how you approach the word…. some nice self-discipline can really help us focus our time and energy, as you note. and I once heard someone say a bit of discipline helps us get more done – like driving with a map. and my observation is that i think you show balance when you blog – taking pauses as you need them and all that. a regret I have from last year was when I did the February blog challenge I set for myself and I did not enjoy – but pushed on because I wanted to follow through. On Day ten I should have stopped – or modified – but I was too committed – to a hobby that is… hah – and so now I have learned – that when it comes to blogging I reserve the right to modify any aims… ha! i don’t have a word for this year yet… still thinking…. Yes, we should stop with things that do not bring us pleasure. Some of the challenges presented in blogging do sound interesting – but some of them do get a bit overwhelming. When you do think of a word Yvette, please share it with us. I have found that sharing our ideas does help us to focus on them more – and help us achieve some of our goals. thanks – and I am completely stumped…. Hello Colline! I’d kind of lost touch with you – having taken the whole summer off from blogging. It’s nice to be back. I like your post, and I guess to me discipline means self-discipline. More exercise would be my main aim! Nice to see you Jude – and glad you have returned back to the world of blogging. Sometimes we all need a break from social media. All the best for 2017. May it be filled with blogging and photography. Your happiness goal for 2017 is definitely worth pursuing. Thank you for sharing your post on hw you intend to achieve this. That brings to mind a person determined on achieving goals. 🙂 Good luck. guess what? I am back with my word for 2017…. I like to pick “f” words – and this one fits because I was looking for ‘quality’ in what I do and also want to trim excess and maybe have ‘minimal” with quality. do you think fineness counts for that??? Oh, most definitely. This word can be linked to every part of your life – quality over quantity. I hope you aree going to blog a bit about your word Yvette. well maybe I will – and I am sure you are off to school – but how is your discipline word going so far? seems on track….